The International Telecommunication Union (ITU) is the leading United Nations agency for information and communication technology issues. Based in Geneva, Switzerland, the ITU includes in its membership 193 Member States and several hundred Sector Members and Associates. The Secretary-General of the ITU is Dr. Hamadoun Touré, who is a licensed radio amateur with the call sign HB9EHT. In addition to the General Secretariat the ITU has three Sectors: Radiocommunication (ITU-R), Development (ITU-D), and Standardization (ITU-T). The International Amateur Radio Union (IARU) is a Sector Member of ITU-R and ITU-D and participates in the Study Groups of both Sectors. The Secretary-General, Deputy Secretary-General, and Directors of the three Sectors are elected by the Member States at Plenipotentiary Conferences held every four years. ITU-R is very important for radiocommunication services, including the amateur and amateur-satellite services. Every three or four years the ITU holds a World Radiocommunication Conference (WRC), usually in Geneva, to revise the international Radio Regulations. There is a lengthy preparatory process for every WRC. The ARRL participates in the domestic preparatory process in the United States and the IARU participates in the process at the international level. ITU-R Study Group 5 and its Working Party 5A are the “home” of the amateur and amateur-satellite services, among others. The Working Party develops Recommendations and Reports on relevant topics. ITU-D is where much of the ITU’s work on disaster response takes place. Ensuring that Amateur Radio’s role in disaster communications is understood and appreciated by the ITU members is the main focus of the IARU’s participation in ITU-D. The ITU sponsors exhibitions called TELECOMs, where visitors can tour telecommunications-related displays and attend forums. The IARU generally participates in TELECOMs to explain Amateur Radio to telecommunications administrators. Amateur Radio is fortunate to have a permanent presence at ITU Headquarters in the form of 4U1ITU, the club station of the International Amateur Radio Club. ITU Headquarters as shown on the QSL card of the International Amateur Radio Club station 4U1ITU. The station is located on the top floor of the building in the center foreground; its antennas are on the roof. 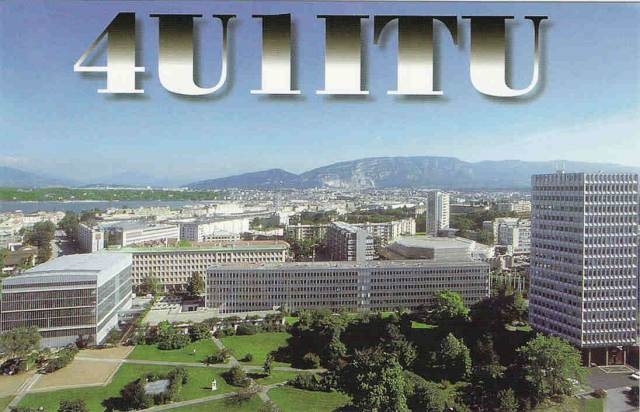 During 2015 the station will use the call sign 4U0ITU to mark the 150th anniversary of the ITU. The call sign 4U1WRC will be used during the World Radiocommunication Conference in November 2015. 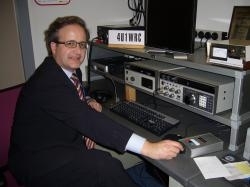 IARU President Tim Ellam, VE6SH, operating the International Amateur Radio Club station under the special call sign 4U1WRC during a previous WRC.